Now this is a wall i'm really proud of, there are soooo many things and little touches. Done that i wanted something easy and realistic to put behind it, and this shot from the Hubble space telescope was just what i needed: colorful, intriguing and most of all REAL. Now it was the time for another hard part, make the window in a sort of futuristic fashion. A picture of an airplane window was what i needed to start, but i transformed it so much that it really have no more resemblance to the original. A bit of colouring and sharpening and the window panel was done, with a touch of hand drew feeling that i like. Now the fun started : you can't clearly notice it unless you have the original to compare the picture with and without that layer, but actually there really is the window glass. It screens the background, adding noise and a bit of other effects, at very low opacity. 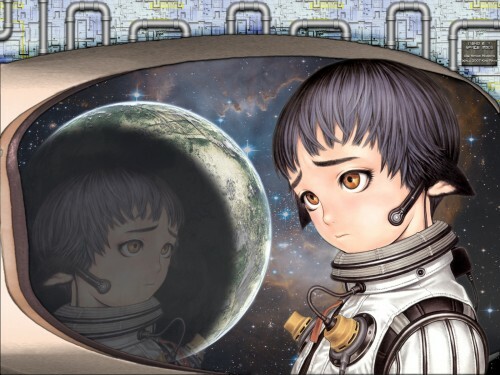 It does not only have a subtle realistic effect on the planet and space making them really seem behind the slightly opaque - and a little bit dirty - glass, but it's most important to make the girl reflection on glass look real. The reflection itself is rather simple, distorted to strenghten the slightly curved glass feeling and to "justify" its positionm not totally natural for the viewer point of view but the best looking one as an "artistic" point of view to keep every portion of the picture interesting. And... that's it. Too many layers to count 'em, really, i must be at around 150 layers counting those of the planet, made it in... hmmm, let's see... about 9-10 hours. I still don't think it's perfect, of course, there are definitely some things that could have came out even better, but i'm really proud of how i was able to make it turn out exactly as i had in mind even experimenting some tricks on the inspiration of the moment, trial and error way.